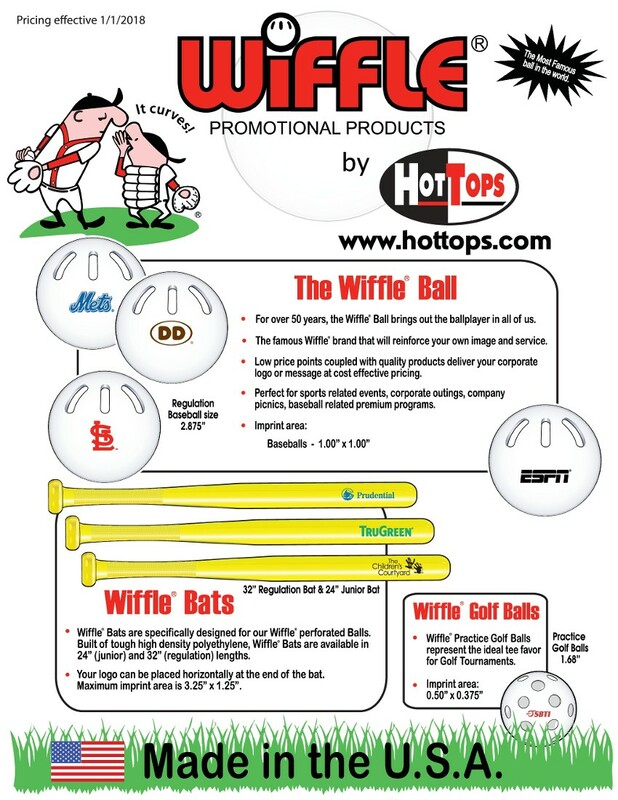 Hot Tops is the exclusive printer of Wiffle Products. For over 50 years, the Wiffle Ball brings out the ballplayer in all of us. 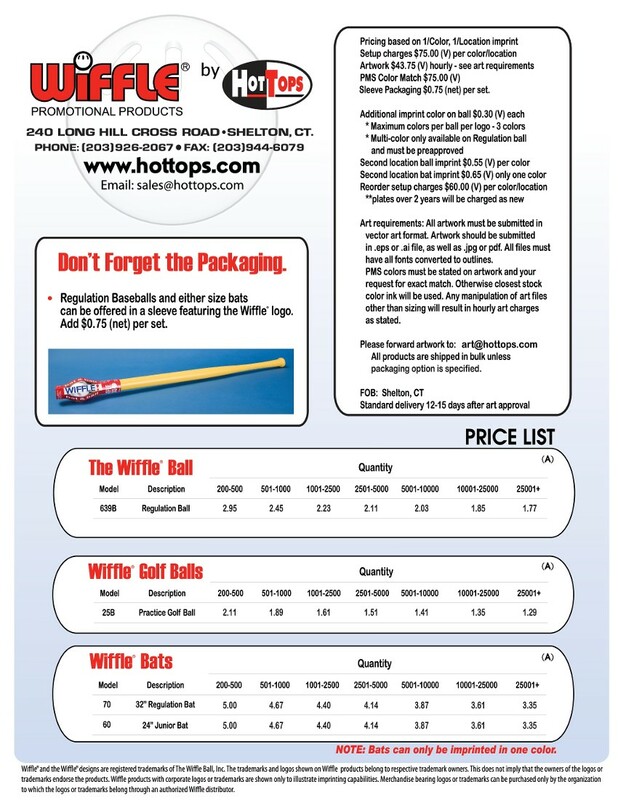 Put a little fun in your next corporate outing with custom printed Wiffle balls, bats, or both! Low price points coupled with quality products deliver your corporate message at a cost effective price. Pricing based on 1/Color, 1/Location imprint. Setup charges $75.00 (V) per color/location. Artwork $43.75 (V) hourly - see art requirements. PMS Color Match $75.00 (V) . Polybag $0.75 (net) per set. Additional imprint color on ball $0.30 (V) each. *Maximum colors per ball per logo - 3 colors. *Multi-color only available on Regulation ball and must be pre-approved. Second location ball imprint $0.55 (V) per color. Second location bat imprint $0.65 (V) only one color. Reorder setup charges $60.00 (V) per color/location. **Plates over 2 years will be charged as new. Art requirements: All artwork must be submitted in vector art format. Artwork should be submitted in .eps or .ai files, as well as .jpg or pdf. All files must have all fonts converted to outlines. PMS colors must be stated on artwork and your request for exact match. Otherwise closest stock color ink will be used. Any manipulation of art files other than sizing will result in hourly art charges as stated. All products are shipped in bulk unless polybag option is specified. FOB Shelton, CT Standard delivery 12-15 days after art approval. Wiffle and the Wiffle designs are registered trademarks of The Wiffle Ball, Inc. The trademarks and logos shown on Wiffle products belong to respective trademarks owners. This does not imply the owners of the logos or trademarks endorse the products. Wiffle products with the corporate logos or trademarks are shown only to illustrate imprinting capabilities. Merchandise bearing logos or trademarks can be purchased only by the organization to which the logos or trademarks belong through an authorized Wiffle distributor.